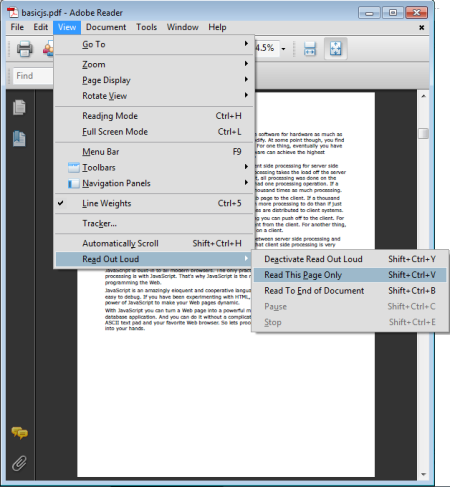 Everyone is familiar with Adobe's free Acrobat PDF Reader, but not many people realize that version 6 or higher has an accessibility feature for the visually impaired. It has a text to speech feature similar to Microsoft Windows narrator, which reads text outloud. Maybe you're visually impaired, or maybe you're just tired of reading so much. To use Adobe's Read Out Loud function your PC must have a working sound circuit and a speaker. Here's how to use Adobe's Read Out Loud. 1. Open the PDF document in Adobe Acrobat Reader. 2. In the main menu select View | Read Out Loud | Activate Read Out Loud. 3. In the main menu select View | Read Out Loud | Read This Page Only or Read To End Of Document. o To use Read This Page Only, click on the Show one page at a time icon in the main menu. 4. To pause reading, in the main menu select View | Read Out Loud | Pause. 5. To resume reading, in the main menu select View | Read Out Loud | Resume. 6. To deactivate Read Out Loud, in the main menu select View | Read Out Loud | Deactivate Read Out Loud.